From a young age, I’ve wanted to design video games. I would take sheet after sheet of paper and fill them with drawings of levels, enemies, descriptions of power ups, and more. I didn’t know how to actually code the games. In addition, I’d often be building on established franchises. I didn’t think Nintendo would want me coding an unauthorized Mario game. Except, now they’ve given me the ability to do just that. Enter Super Mario Maker. Super Mario Maker lets you design your own Mario levels. The levels can be over-ground, underground, fortress, etc. They can be in the style of many different Mario games from the original 8 bit Super Mario Bros. to New Super Mario Bros. U. Placing level elements or changing level designs is simple using the WiiU gamepad’s point and click interface. Want to place a pipe? Just drag it into the right spot. Want to move a Koopa? Just click and drag it around. Want to make a platform wider? Just click on the end and pull it. In addition, some elements respond to shaking. Shake a green Koopa (which walks in a straight line) and it turns red (and turns around when it reaches a ledge). Shake a moving platform and it becomes a dropping platform. Shake Bowser and he becomes Bowser Junior. Enemies can be modified with super mushrooms (which makes the enemy bigger) and wings (which makes the enemy fly). Finally, sound effects can be placed to be triggered at certain events. If all of this sounds overwhelming, don’t worry. 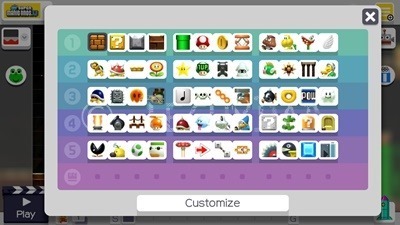 Super Mario Maker starts you off with a small subset of its options. Over time, as you play, more and more options are revealed. By the time the full array of possibilities is at your disposal, you’ll be placing level elements like a pro. If Super Mario Maker ended here, it would be a pretty great game, but Nintendo went a step beyond. 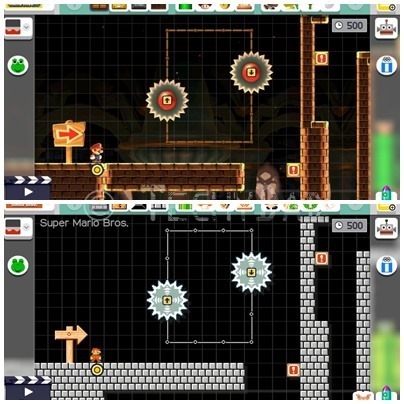 Once levels are added, you can share them with other Super Mario Maker users worldwide. Before a level can be shared, you’ll need to play through it. This ensures that no impossible levels get uploaded. The levels might be insanely hard, but they will be playable. You can even share levels by posting course IDs (e.g. 2D00-000-0082-EBA6 – and yes, that’s one of mine and last I checked nobody has beaten it). 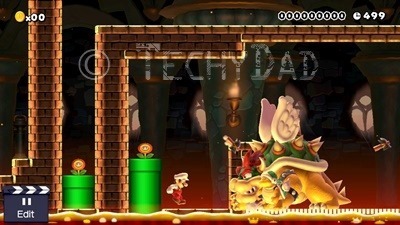 You can play selected levels in the 10 Mario or 100 Mario challenges. You can even use Amibos to power-up the original Super Mario Brothers’ Mario into various characters via "mystery mushrooms". (Admit it, you’ve always wanted to play Super Mario Bros. as Link from Legend of Zelda.) Shared levels can be downloaded and edited (but not re-uploaded so don’t worry about someone taking your masterpiece, adding a power-up or two and trying to pass it off as their own). This is definitely a game that my boys and I will be playing for quite awhile. I’ve already made half a dozen levels (not all uploaded) and I feel like I’ve only scratched the surface of what is possible. 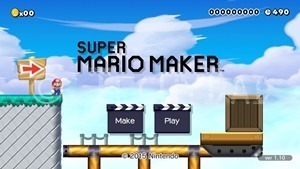 Super Mario Maker is great for any kid of any age who has always wanted to designing video games. DISCLAIMER: We purchased Super Mario Maker ourselves and weren’t compensated in any way for this review. Oh cool! First, you brought back some forgotten memories of me creating levels of platform video games on notebook paper when I was in junior high (loved it). And second, now I want a copy of this game! Cary Vaughn recently posted..Will A Cat Trip Balls If You Brush Its Teeth?